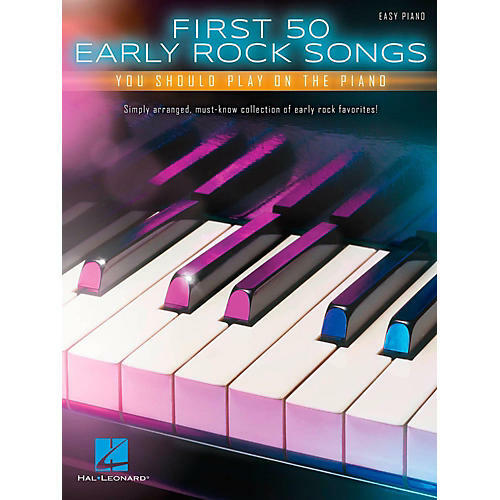 Selection of easy rock songs for piano. Take a trip back to the golden age of rock 'n' roll with this simply arranged, accessible collection of 50 early rock songs. Hits include: Ain't That a Shame • Blue Suede Shoes • Do Wah Diddy Diddy • Earth Angel • Hello Mary Lou • La Bamba • Louie, Louie • Oh, Pretty Woman • Runaround Sue • Sea of Love • Silhouettes • A Teenager in Love • Tutti Frutti • Twist and Shout • Under the Boardwalk • The Wanderer • Whole Lotta Shakin' Goin' On • and many more.